The streaming service Netflix recently announced that it had passed the 60million subscriber mark worldwide. Roughly 40million of those are in the US, which helps to explain why the company is planning an ambitious expansion plan, particularly in Europe, Australia and Japan. Shares in Netflix have also risen by around 40% since the start of the year, and Netflix also said revenue increased by 23% from the same period a year earlier to $1.57bn (£1.06bn). Programmes such as House of Cards have characterised Netflix’s appeal; popular, exclusive, original content at the users’ fingertips. 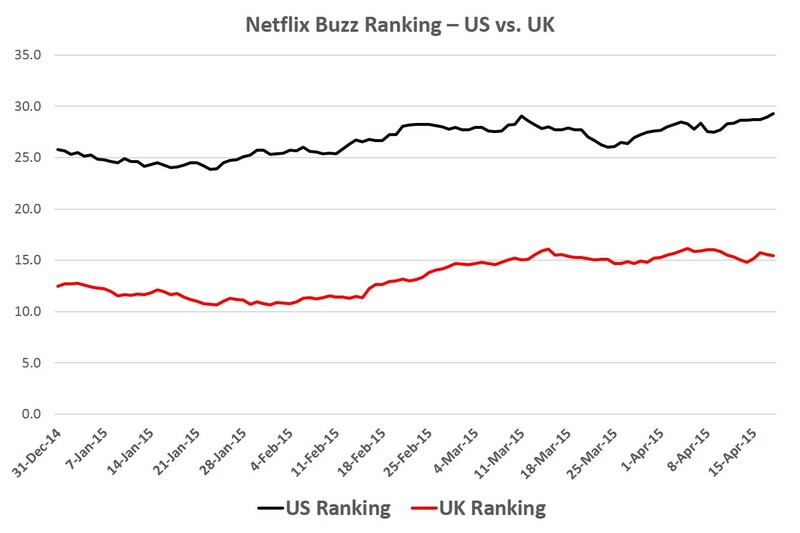 But what does YouGov BrandIndex data tell us about Netflix’s success, and where can it go from here? YouGov’s Buzz Metric measures whether a respondent has heard something positive or negative about a brand in the previous two weeks. 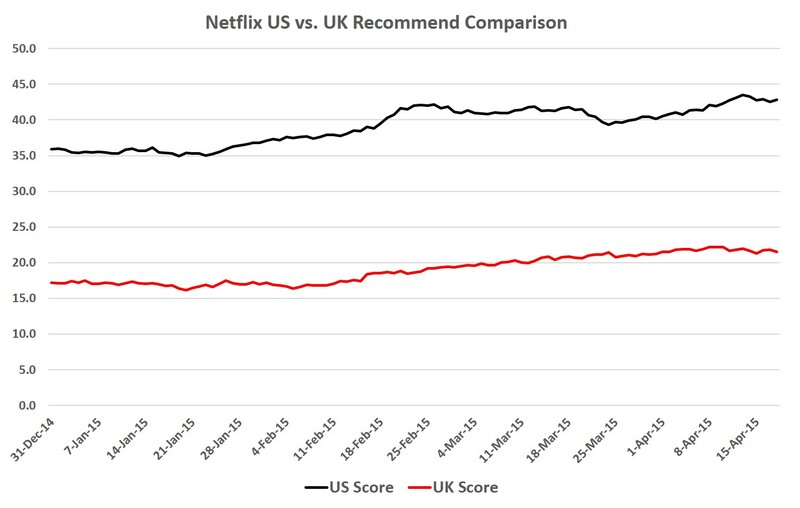 When we compare Netflix’s buzz score in the US and UK, we see a similar story of success and of a steady increase in rating. In the US, the score has risen from +26 at the start of the year, to +29 now. In the UK, the score has risen from +10 in mid-January to +16 in mid-April. The signs are good therefore, for growth on both sides of the pond. Clearly, Netflix wants word of its service to not just be heard through its advertising, but also in an organic manner too. YouGov’s Recommend metric underscores this notion. Both in the US and UK, an increasing number of respondents are saying they would recommend the streaming service to their friends or family. In the US, the score has risen steadily from around +35 at the turn of the year to +42 now. For comparison, here in the UK the rating shows a shift from +17 to +22. It is clear that Netflix’s strategy is working and subscribers are very receptive to the content they provide. As internet TV gains ever more traction, Netflix will be delighted with the position they hold. However, with rivals such as HBO and Hulu looking for ways to compete, Netflix’s expansion plan will be crucial in maintaining its position as industry leaders.